My wife and I didn't have solid dinner plans last night so, as is usually the case when that happens, I wound up stopping at the grocery store on my way home and picking up a couple frozen pizzas for dinner. Since my daughters just like cheese pizza, I wound up getting them a cheap brand. 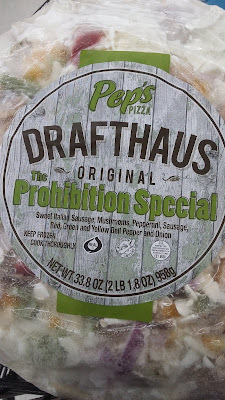 But, I was in the mood to try something a little different so, after some consideration, I purchased the Pep's Drafthaus Prohibition Special for my wife and I. At $8.99, this pizza was more expensive than I would normally prefer to spend on a frozen pizza and, because of that, I did have some second thoughts about my purchase. However, cooking this pizza on our pizza oven last night and giving it a try, I do have to say I was very impressed with it. One of the reasons I took a chance on this brand when I saw it in the freezer was it looked like it had quite a few toppings on it. 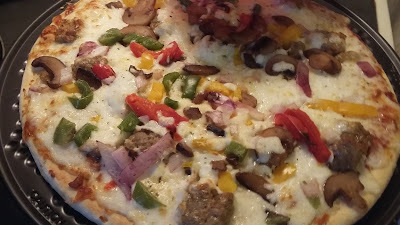 This included a lot of cheese, sausage, mushrooms, pepperoni, peppers and onions. Since lack of toppings is one of my biggest pet peeves about frozen pizzas (especially if I spend more than $5 on one), this was something I definitely found attractive about it. As it turns out, this pizza did not disappoint in this category. The Pep's brand had more than enough cheese and there seemed to be a piece of meat or vegetable in just about every bite we took. As a result of this, the pizza wound up being much more filling than I would normally expect from a frozen pizza and my wife and I were each only able to get through two slices as a result (though I did have a third one later in the evening). The fact we wound up with enough leftover for lunch the next day did add some value to our purchase. I also thought the pizza had a good flavor to it. A lot of frozen brands tend to go a bit overboard with the spices. That was not the case with this brand. There was a good blend of spices in the sauce, but not enough to make the pizza spicy. And, the various toppings did a good job of complementing each other. I was also a fan of the crust, which wasn't paper thin (like many frozen brands) but thin enough to get a little crispy. This mean I could pick up a slice of pizza without having it fold over and make a mess. That, alone, would place this brand above many other frozen pizzas we've purchased. Final Opinion: This brand cost a little more than I normally would spend on a frozen pizza. However, it proved to be worth the money and I would purchase it again as a result.